Greenpeace released the 8th edition of its annual report, Carting Away the Oceans, which evaluates 26 major retailers on their seafood sourcing and sustainability. Whole foods and Safeway topped the ranking guide. Four supermarkets -- Roundy's, Bi-Lo, Save Mart and Publix -- failed altogether. Kroger, the fifth biggest food retailer in the world, is exposed for selling the most Red List species of any U.S. grocery chain, for the third consecutive year. "Consumers want to be able to walk into their local grocery store and know that all the options are sustainable," said James Mitchell, Greenpeace Senior Oceans Campaigner. "That's why Greenpeace is pushing companies like Bi-Lo, Save Mart and Roundy's to drastically improve their sourcing, so that making the right decision is easy for their customers." 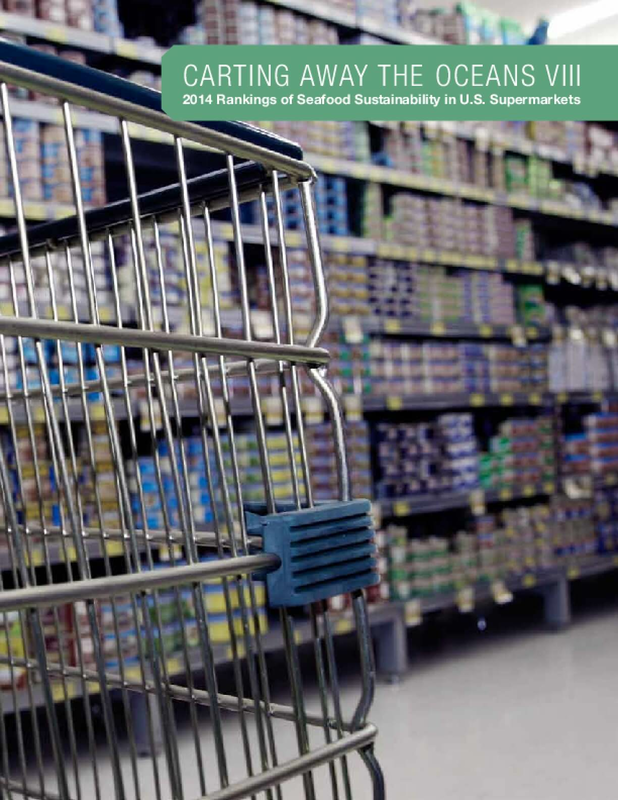 Hy-Vee was evaluated for the first time and immediately entered the top five best performing retailers for sustainable seafood sourcing. Four of the top five supermarkets have, or will shortly launch private label (store brand) sustainable canned tuna products. Consumers will now be able to find sustainable and affordable alternatives to destructively-caught tuna at Whole Foods, Safeway, Trader Joe's, Hy-Vee, and Walmart. The report gives further credit to Whole Foods and Trader Joe's for not stocking Bumblebee, Chicken of the Sea or StarKist's tuna, which are caught using destructive fishing methods. "When Greenpeace started ranking America's retailers on seafood sustainability in 2008, every company failed. We've seen huge improvements since then, yet grocery giants like Kroger are still stocking too many threatened Red List species, which are often caught using highly destructive fishing methods." said Mitchell. Despite progress made by the retail sector overall, overfishing, destructive fishing, and illegal fishing are still major problems for ocean conservation and the economies of developing countries. Populations of the ocean's top predators like sharks, tuna, and swordfish have dropped by as much as 90% over the past half-century. Bycatch - where species like sharks and turtles are caught unintentionally in the process of fishing, then thrown back into the sea dead or dying - threatens marine ecosystems as well as global food security. Copyright 2014 by Greenpeace. All rights reserved.